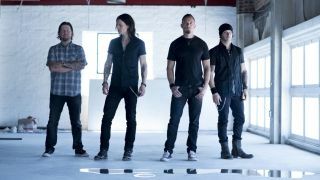 Alter Bridge have announced that they’ll play two special shows later this year at London’s Royal Albert Hall. They’ve lined up the performances for October 2 and 3 where they’ll be joined onstage by a symphony orchestra. A statement about the shows reads: “Appearing at the legendary Royal Albert Hall in London for the first time, the band will treat the audience to an array of songs never before played live as well as fan favourite hits, drawn from their acclaimed five album catalogue. Tickets for both October shows will go on general sale from 10am GMT on June 16 (Friday) via Live Nation. Earlier this month it was announced that Alter Bridge would release a three-disc collection of live and rare studio material on September 8 via Napalm Records. Titled Live At The O2 Arena + Rarities the band’s full 19-song performance at the London venue in November last year. Alter Bridge are currently on the road across Europe. Find a full list of their 2017 tour dates below.